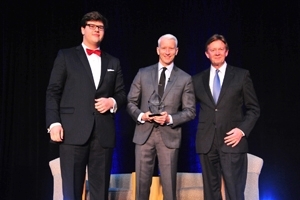 From left, KPU director Chandler Thornton, 2013 Wonk of the Year Anderson Cooper, and AU President Neil Kerwin. Photo: Jeff Watts. Anderson Cooper spoke in front of a particularly enthusiastic crowd on Saturday night, October 19th, at American University’s Bender Arena. That’s because Cooper, an esteemed CNN journalist and anchor, exemplifies values AU students admire. He’s smart, passionate, focused, and engaged, and AU and the Kennedy Political Union (KPU) have honored him as Wonk of the Year for 2013. Chandler Thornton, director of KPU, subsequently gave introductory remarks. “I can’t think of anyone better to honor with this award tonight than Anderson Cooper,” he said. Soon after, the crowd was treated to a big surprise. Fellow CNN anchor Wolf Blitzer greeted the crowd by video, in the form of a “breaking news” alert. “Anderson, as all of you know, is a real, real wonk. He knows wonkish details of everything!” Blitzer said. Anticipation had been building for Cooper’s appearance, and the seasoned reporter did not disappoint. He began his speech with a good-hearted joke. “I realize why there are a lot of students here, because you’re all trying to impress your parents that this is what you do every Saturday night in Washington, D.C.,” he said, to laughter. Throughout the night, Cooper expressed a desire to give a voice to the voiceless. “There’s great value in learning the names of people whose lives are lost, and remembering them and honoring them,” he said. Later on, he told an anecdote about his coverage of the Sandy Hook shooting massacre. He doesn’t believe in using the name of the school shooter, but he hopes to preserve the memory of one of the victims, Grace McDonnell. Cooper has extensively covered the conflicts in Egypt and Syria, the debt ceiling crisis, the NSA surveillance programs, and the Boston Marathon bombings. He garnered widespread praise for his emotional, hard-hitting reporting on Hurricane Katrina, which helped CNN win a Peabody Award. He’s won numerous Emmy Awards, including two for his coverage of the 2010 earthquake in Haiti. Cooper is also a regular correspondent for CBS’s 60 Minutes. The son of prominent fashion designer Gloria Vanderbilt, he earned his bachelor’s degree in political science from Yale University and studied Vietnamese at the University of Hanoi. The event was hosted by KPU, a student organization created in 1968. KPU’s founding was inspired in part by President John F. Kennedy’s seminal 1963 American University commencement speech calling for a nuclear test ban treaty. The evening’s festivities were part of AU’s All-American Weekend, with parents and alumni in attendance alongside students. Launched in 2010, the wonk campaign has a strong presence on campus and throughout Washington, D.C. The wonk label adorns t-shirts, admissions tours and buses, and it’s the focus of advertising in Metro stations, Nationals Park, and The Washington Post. In 2012, the inaugural Wonk of the Year award was presented to former President Bill Clinton. In addition, the evening generated plenty of buzz outside of campus: On Saturday night, @AmericanU, #kpu, #kpuanderson, and #wonk were all trending on Twitter in D.C.